Again we woke up early and caught our train from Barcelona to Nice. 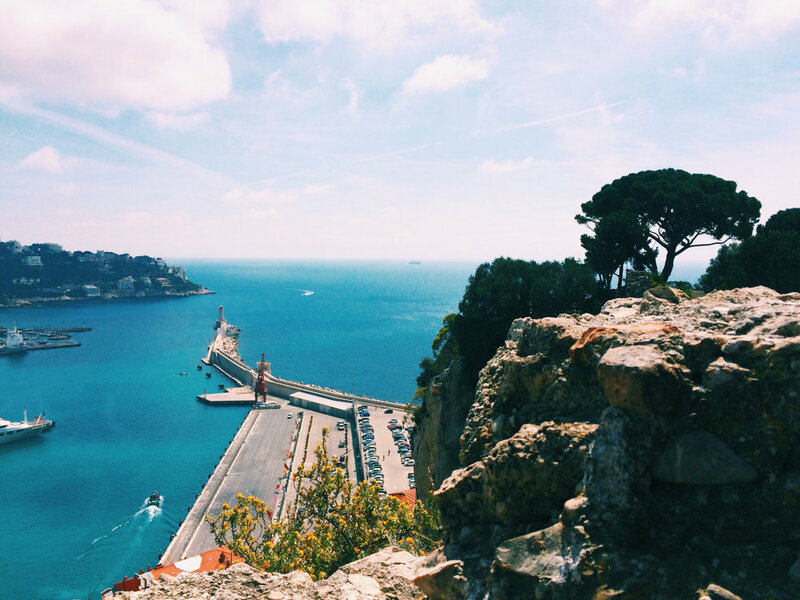 The train ride from Barcelona to Nice was gorgeous. Every train ride had been beautiful, but finally we had begun to transition rom Spain’s dry, high desert into the lush and green scenery of Southern France. I didn’t sleep one bit, not wanting to miss any thing that passed by my window. We had a stopover in Valence and spent an hour in the station grabbing a bite to eat and relaxing. There was a piano in the station that you could play so I sat down and fumbled through the few songs I could still remember. 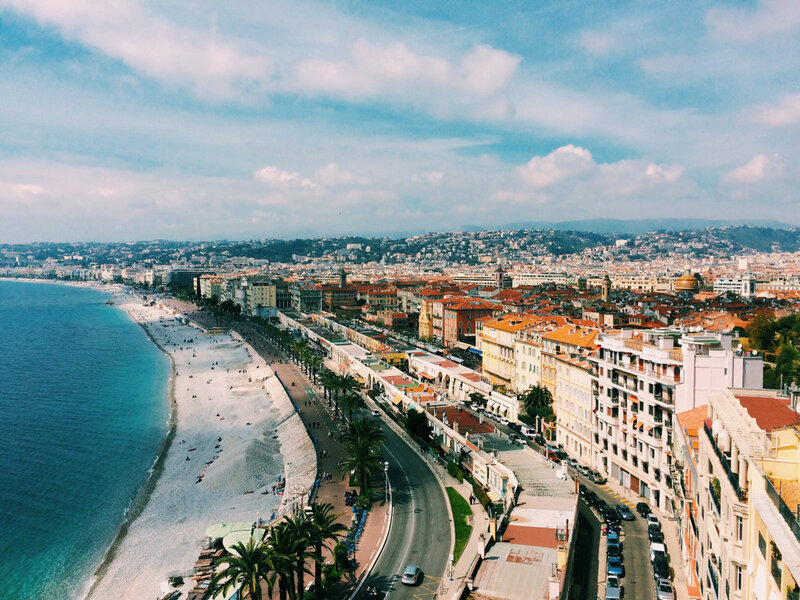 We arrived in Nice in the late afternoon and took an entirely too-expensive cab ride to our Airbnb. This Airbnb was in a large building of apartments. Our apartment had an adorable terrace that overlooked the ocean. Our host Sylvaine couldn’t meet us because she had a family emergency, but her husband Dimitri met us and welcomed us into their home. He and Suze spoke French to each other and I just smiled blankly. It was so strange to transition from Spanish, where I could at least understand what was going on, to French where I am completely lost. It is actually gibberish to me. The situation got even more interesting when Dimitri could not find the right words in French or English and would then speak Russian into his phone, which would translate it into English! Because we had arrived so late that first day, we went to a grocery store nearby and bought some groceries for the three days we would be spending in Nice. This Airbnb came with a breakfast as well and so we enjoyed our baguettes and jam in the kitchen which also had an incredible view of the mountains of Nice. 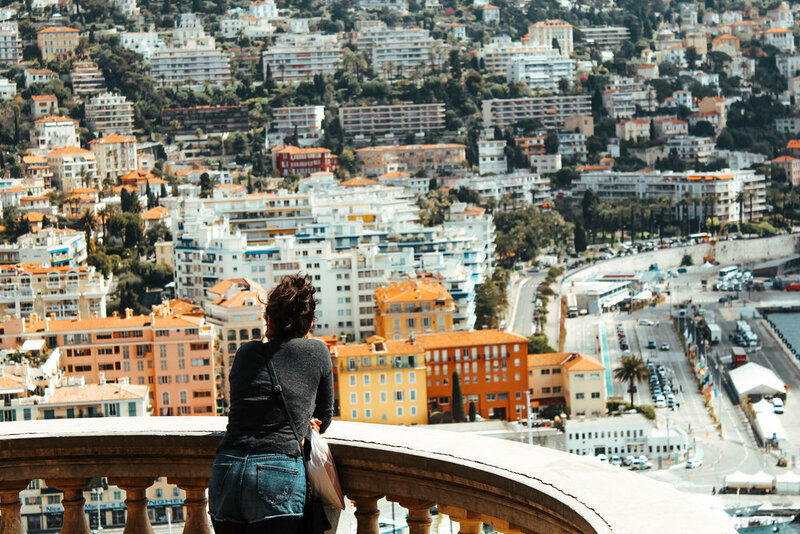 I had found online that one of the best views of Nice was from a castle/hike of sorts that was a few miles from our Airbnb right on the beach. We set out and walked all along the Promenade de Anglais to the Chateau de Colline. We climbed the steps and winding pathways that lead all the way to the top of the mountain. 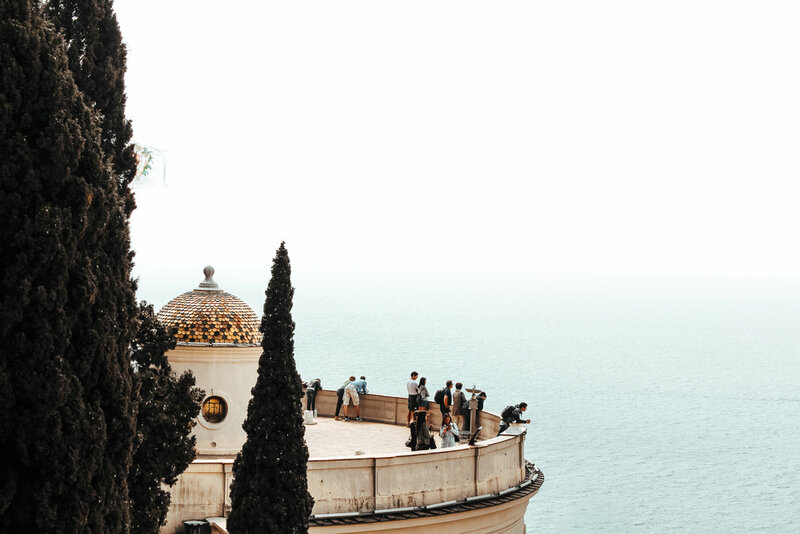 At the top a beautiful waterfall and park overlooked the ocean and city of Nice. We ended up at a small sandwich shop near the promenade for lunch and enjoyed our sandwiches and crepes near the promenade looking out towards the ocean. It was glorious. Afterwards, we decided to sit and soak up some more sun and then later walked around the market and central part of town for the remaining hours of daylight. 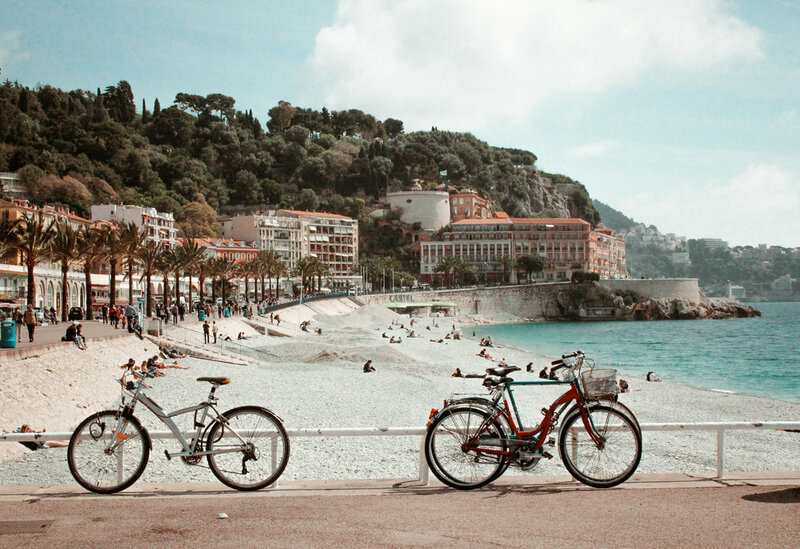 On our last full day in Nice we decided to rent bikes and ride along the coast to see more of Nice. The bikes were really cheap to rent...I soon realized why as soon thereafter my bike started choking-up while changing gears. We rode all along the promenade, around the corner past the Chateau de Colline and into the harbor. The ocean looked even more blue than it had the day before. Eventually the bike path had vanished and we decided to back track (neither of us trusted ourselves to bike on the road) and head back to the central part of town. Again we sat on the beach and swam a little in the ocean before finding food and heading back to our Airbnb to pack up. The next morning we quickly ate our breakfast and set out for the train station…we soon found that our little legs probably weren’t going to help us make our train on time and so we both made a split second decision to rent bikes once more and bike through the streets of Nice…with our backpacks on our backs. I was dying laughing, probably to distract myself from how much my calves and back were hurting. It was a struggle trying to bike with those things on our backs. Needless to say we got our workout in for the day and made our train on time; finally on our way to our last stop before parting ways: Annecy.